Andy Murray makes return to form just in time for Wimbledon success? After a disappointing spell last year, Andy Murray appears to have bounced back from his constant injury problems and has found the kind of form that he showed back in 2013 when he lifted his maiden Wimbledon title. The Scot, who married long-term partner Kim Sears earlier this year, has shown encouraging signs throughout the 2015 tennis season and looks ready to challenge the likes of Novak Djokovic and Roger Federer for one of tennis’ major championship crowns. The 28-year-old has reached the latter stages of both the Australian Open and French Open tournament this year but has failed to win either competition. 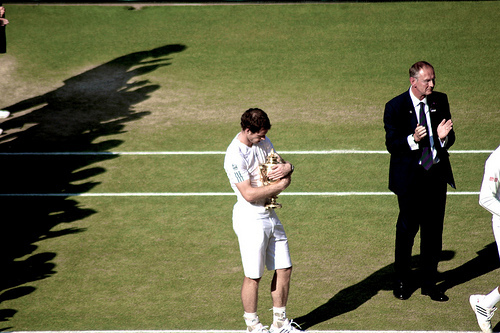 However, many are optimistic that Wimbledon – Murray’s home event – could be his moment. It will be tough, but the Scot is more than capable of reaching his third Wimbledon final and it wouldn’t be a huge surprise to see the 28-year-old lift the title for the second time on 12th July. The Wimbledon draw took place on Friday morning and Murray was drawn against Kazakhstan’s Mikhail Kukushkin in the first round. However, the British number one has a much tougher schedule if he is to achieve his goal of winning the title. Murray could have to go: R16 Tsonga QF Nadal SF Federer F Djokovic To win the title. At the time of writing, Murray has won 41 matches this calendar year while he has been beaten just six times. One of these defeats was to world number one Novak Djokovic in the Australian Open final and the Serbian will be intent on defending his Wimbledon crown this summer. Djokovic is one of the greatest tennis players in the modern era and although his hopes of completing the Grand Slam in the same calendar year are now dashed for 2015, the 28-year-old will still be extremely confident ahead of the grass court event. 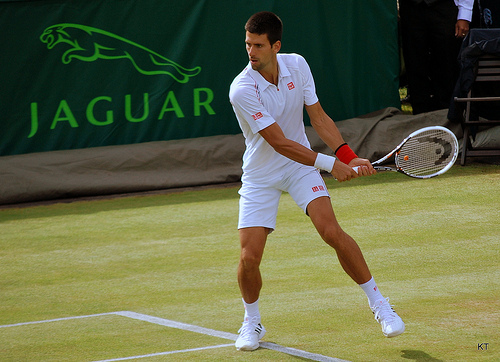 At the time of writing, Djokovic is 5/4 with the bookmakers to win his third Wimbledon title this summer. 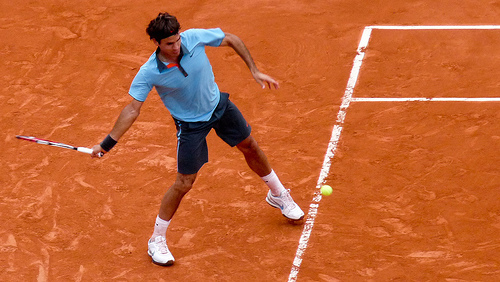 Highlights of his superb victory over Roger Federer in last year’s final can be seen below. Like Murray, the world number one has also won 41 matches this year but he has been defeated just three times – with two of those defeats in two-set tournaments. In the longer format, the Serbian has shown that he remains focussed throughout every set, game and point and that is why he remains one of the greatest champions in the sport. In the opening round of matches, Djokovic will face world number 33 Philipp Kohlschreiber and could face Australian veteran Lleyton Hewitt in the second. That is not an easy start for the defending champion. Roger Federer remains a huge threat to Murray’s hopes of lifting the championship and the Swiss athlete could spring a shock victory this year. The veteran has won 34 of his 40 matches in 2015 and, although he isn’t the same player that he was three years ago, remains one of the greatest players on the planet. On his day, the seven-time Wimbledon champion is capable of beating anybody and the likes of Murray and Djokovic will be worried that the 33-year-old could save his best form for his favourite grass court event. Many tennis fans also believe that Federer is still capable of claiming another Wimbledon victory in this year’s competition, too. Not only is Federer one of the greatest tennis players in recent history, he is widely regarded as the best player to ever grace the tennis court. Unfortunately for the Swiss athlete, age has started to catch up with him but his legacy will live forever at Wimbledon. Many supporters will be hoping that Federer can achieve success one last time and extend his Wimbledon record to eight championships but it will be some ask. If the tournament goes as expected, he will have to beat the in-form Murray in order to reach his 10th Wimbledon final. Tennis fans from all over the globe will be looking forward to the prospect of this mouth-watering clash and, although the Scot is playing some exquisite tennis, Federer would be quietly confident of his chances against one of his closest rivals. On current form, Murray will stand an excellent chance of lifting the men’s singles championship at Wimbledon this year and, although both Djokovic and Federer will provide stiff competition, the British number one will be confident of his chances. His recent victory at Queens outlined his dominance on the grass court and it will be extremely interesting to see if the 28-year-old can progress through the tournament against the likes of Jo-Wilfried Tsonga and Rafael Nadal. 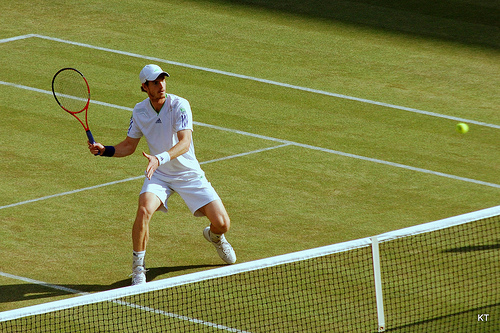 The home advantage could prove crucial throughout the competition and, although many would love for Federer to claim a monumental victory, Wimbledon would explode if Murray was to claim his second crown this summer.